We have partnered with our friends at One Barrel Brewing and Next Door Brewing to celebrate the Madison beer scene. If you visit all three breweries in one day, we will reward you with a fantastic gift for your efforts. Ask your server or bartender at your first stop for a Beerfecta punch card. At each location order a brew & get a punch in your card. At the last stop present your card for a commemorative pint glass with all 3 of our logos. The Beerfecta is an ongoing promotion. 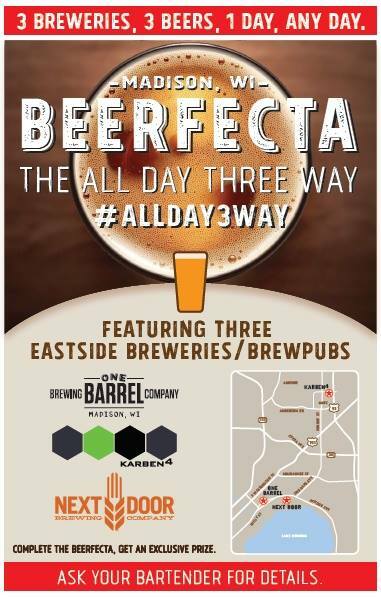 Any day of the week is a good day for an All Day Three Way!